Whether you ride every day or just a few days a week, the right pedals can make your road bike more comfortable to ride. You’ll find plenty of pedals on the market today, but not all are worth the cost. Compatibility: Are the pedals compatible with your bike? In many cases, you can enter the make and model number of your bike to see if the pedals are compatible. Otherwise, you’ll need to check the dimensions and other technical specs to make sure they’re a good fit. The last thing you want is to buy a pair of pedals that will not fit properly on your bike, so take the time to ensure the model you’re considering is compatible. Easy to Use: Some pedals are easier to clip into than others. The easier the clip-in, the better in most cases, so look for models with an easy entry/exit design. Easy use is also important for riders with arthritis or beginners who are just starting with clipless pedals. Material: Check the material of the pedals, as some are more durable than others. Models made of aluminum are lightweight, and those made of resin are extremely durable. The harder the material, the more resistant to abrasion, dents, and dings. Some models, like the Ultegra PD-6800, are made of aluminum and carbon fiber to keep them as light as possible, and are a great option for serious riders. Shimano PD-R540 – For riders who want more stability, the Shimano PD-R540 is a great option. These pedals have a wider platform, so your feet stay stable even when riding on bumpy roads. They have a cleat-dependent float, too. The sealed cartridge axle is low maintenance, and the large binding target makes it clipping in quick and easy. Made of chrome and aluminum, these pedals are compatible with SPD-SL cleats (Shimano includes a pair). No matter how rough the ride, these pedals won’t dent or bend. Available in black and white colors, the PD-R540 pedals from Shimano are compatible with most road bikes. 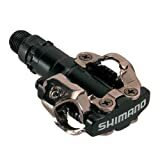 Shimano SPD-SL PD-R540-LA – Weighing just 330g per pair, Shimano’s PD-R540-LA pedals are lightweight and feature a lighter spring tension. 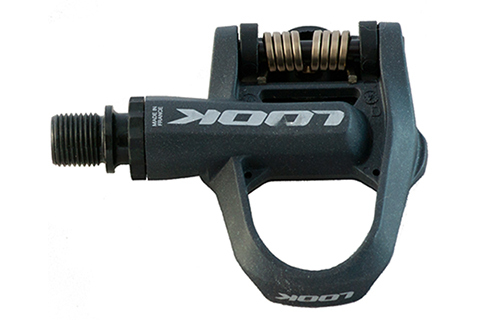 For riders who want light pedals that are easy to clip in, this model may be the ideal choice. The sealed cartridge axle keeps these pedals low maintenance, while the resin body allows for maximum durability. The cleat retention adjuster allows for a comfortable fit, and the design of the pedals allows for more stability. 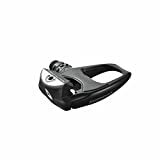 These pedals are easy to clip and unclip thanks to the light action, and you’ll never have to worry about accidently unclipping mid-ride either. Shimano’s PD-R540-LA pedals are available in black and white, and are compatible with most standard road bikes. Cleats are included with the pedals, so you can start riding right away. Shimano PD-R550 – Featuring a lightweight resin body, Shimano’s PD-R550 pedals won’t weigh you down. And like the PD-R540-LA pedals, this model is extremely easy to clip and unclip. The spring tension adjustment system offers a wide range, so you can choose the most comfortable fit for your feet. The entry-target is large, too, so cleat engagement is virtually effortless. The wider platform makes it easy to find the perfect position for your feet, and the resin body ensures extreme durability. These pedals also have a stainless steel cover to further protect the body from abrasion. The PD-R550 pedals are great for all riding levels, and come equipped with all the right features for excellent road performance. Shimano Unisex PD-M520 – The PD-M520 pedals from Shimano are unisex and come in three colors: black, white and silver. These pedals feature an open binding mechanism to keep them mud-free, and the cleat tension adjustment allows you to customize the pedal’s fit to your liking. The sealed cartridge axle keeps maintenance to a minimum, and the chrome-moly spindle adds to the pedals’ durability. These pedals are compatible with SPD cleats, and feature dual-sided entry for quick and easy use. Weighing just 380g per pair, these pedals are light and extremely easy to install. If you’re new to clipless, the easy entry/exit of this model makes it a great choice for newbies. Shimano Ultegra PD-6800 – Made with carbon fiber and aluminum, Shimano’s Ultegra PD-6800 pedals are for serious riders. These high-end pedals are made with ultra-lightweight and highly durable material, so you never have to worry about dings and dents from rougher rides. There’s also a stainless steel cover that offers further protection from abrasion. Adjustable entry and release makes it easy to get in and out of these pedals, and the float of +/-3 degrees allows for maximum comfort. They have a wider platform, too, for high energy transfer. With the SM-SH11 cleats installed, these pedals weigh 353g. Without the cleats, they weigh a mere 283g. Cleats: All clipless pedals require the use of cleats, and nearly all models come with a pair. But these cleats require the use of riding shoes. For this reason, you’ll need to check the product description to see what type of cleats the pedals use, and make sure your shoes are compatible with them. Adjustability: Most clipless pedals have adjustable features that allow you to customize the fit to your liking. Make sure the pedals you’re considering have a decent amount of adjustability. Otherwise, you may find that riding with your new pedals is extremely uncomfortable. Maintenance: Pedals with a sealed cartridge axle require virtually no maintenance, which makes them a great option for anyone who is always on the go. Most models on our list have a sealed cartridge. Weight: The weight of the pedals should also be considered. Most modern models are lightweight, but double check to make sure they won’t weigh your bike down. Weight is typically found in the product description, and is listed as grams per pair. Cost: The price of the pedals is another consideration. While most road bike pedals are affordable, some – like the SM-SH11 pedals – come at a higher price. In most cases, more expensive pedals are made with high-end materials, like carbon fiber, that are lightweight. If you’re a serious cyclist, a pair of high-end pedals is worth the cost.